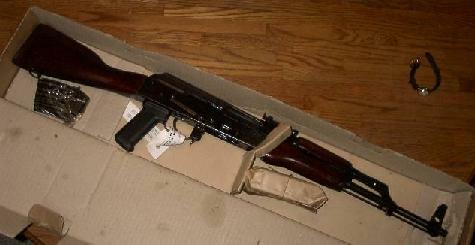 First remove the magazine and open the action to ensure that the rifle is not loaded. I know its kind of dark, but its the only before hand picture i could find of a sar that was finished with the burgundy paint on finish. Ive had a few experiances with refinishing wood stocks before, and knew that even if it wasn't pretty wood underneath, at least it could be painted black and made into an evil assault rifle. The first thing that you will need to do is find a place outside that will work for doing ths modification - the BIX stripper puts off some pretty nasty fumes. I found an old piece of plywood that i used to shield everything from the stripper - the stripper will discolor your concrete, metal surfaces, and even glass, so i used a piece of plywood that i didnt care about. Now get a small bucket of water (a 5 gallon pale works perfect) and fill it with water - set it next to the plywood. Then get out the course steel wool, and drop it into the bucket of water. Next you will need to remove the furniture from your rifle and set them aside. For instructions on how to do that, please click here. Please note that if youre rifle is parkerized like mine was from Century, you do not need to remove the gas tube from your upper receiver - the BIX will not harm the parkerizing. If you have painted the rifle, then you will need to remove the gas tube because the BIX will remove the paint. Once you have the furniture laid out on the scrap plywood, and you have your bucket of water waiting with the course steel wool pad in it, open up the quart of BIX. You will notice that the BIX is the consistency of thick syrup - this is good because the more you have sitting on the wood, the better it works!! 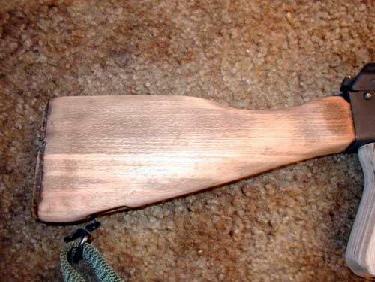 I started with the buttstock - i dont recommend doing all the pieces at once, because if the BIX dries, its a pain. Pour the BIX onto the buttstock, and take a rubber glove, and spread the bix over the entire buttstock - then take your hand (with the rubber glove on) and wipe up the BIX that spilled onto the plywood, and take this and work it all over the buttstock - the more BIX you have on it, the better it will work. 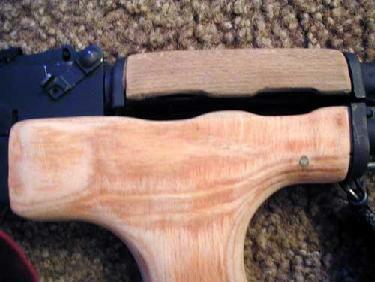 i poured a decent amount onto the buttstock, and it all ran off onto the plywood so i took the buttstock, and rolled it into the BIX that was on the plywood - remember - the more that you have on the wood, the better job it will do. After about a minute, or two - you will notice the BIX turning dark black or dark burgundy - this means that its ready to scrub the old finish off with the steel wool. take the steel wool from the bucket of water, and shake the excess water off of the steel wool, and then start scrubbing the buttstock with as much pressure as you want - you will begin to see a bright orange piece of wood underneath the old finish - once all of the burgundy crap is scrubbed off - dunk the buttstock into the pale of water, and scrub some more with the steel wool - once you pull the buttstock out of the water, you will see that most of the old finish is gone. There will be spots where the old finish wasnt removed - simply recoat the buttstock with the bix in the spots where the old finish is left, and wait for a minute or two, and then start scrubbing these areas with the steel wool, and then dunk, and scrub in the water until all the old finish is gone - ive noticed that a wire brush in the shape of an old toothbrush will take off the old stain in the hard to get to areas like around the buttstock where the buttpad mounts. dont scrub too hard, or it will take sanding to remove the scratches from the visible areas of the wood. You do not need to let the buttstock dry in between coats of BIX, but i would wipe the excess moisture down with an old rag. Follow the exact same procedure with the lower handguard, and the upper handguard, and if you have a wood pistol grip, you can do it with that also.